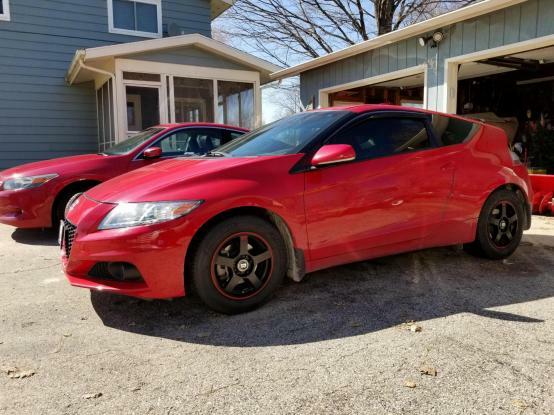 Honda CRZ Forum: Honda CR-Z Hybrid Car Forums > Honda CR-Z: General > General Discussion > What did you do to the 'Z today? Funny that, I replaced mine too, went with the Indy 500 Firehawks. how do you like them? I'm a little concerned about them for wet traction, but want to get them sometime this summer when my OE dunlops are dun and lopped. From this evening they seem fine in the wet so far, have not hit any standing water yet, but I generally try to avoid that as it is with the car height. But general wet wipers on full, Stopping and acceleration seems to have no issues except on the Paint in intersections as is normal. Got a fifty-dollar eBay arm rest. Plugs into the cup holder like the Zeta did, part of why I liked the design. Good quality, commensurate with the price. Some under-rest storage, and a riser that could be left out if you like. Delivery was quick enough to not be a bother. Needs assembly, nothing challenging. With the spacer installed, it comes out to the same height as the door arm rest. It doesn't fold up, but both the pad and its holder slide forward and backward about five inches. Good by winter tires, hello new wheels! Defiant, CuteZ, 96firephoenix and 2 others like this. put my summer wheels back on... Need some new tires sooner than later. That sweet sweet tax refund is on its way though. Also ripped off the stupid front plate holder. Finally. Been over 3 years. How strict are they in your area for front plates? When you remove it doesn't it leave horrible self tapped holes? Removing the front plate holder was one of the first things I did when I got my CRZ. You are correct in that there are holes in the front and, the black grill is a little different color where the holder was. I am happy with it gone. Much better look in my opinion. Earlier this week... Washed the CR-Z. Poor thing was absolutely filthy and looked beige instead of Ivory Pearl. I'm currently debating on replacing my MTF tomorrow since I'm off this weekend or wait until I have to do the oil change (MMS is at 50% now). I don't drive the car as frequently anymore, just to and from work which is a only 4 mile trip one way BUT its mostly in small town, with a hand full of red lights to stop at. Veni, vidi, velcro... I came, I saw, I stuck around. IN doesn't have a front plate reqt at all... I bought the car from IL which is supposedly really strict. I do have a little bit of fading there, but once it warms up, I'll hit it with some "back-to-black" trim cleaner. if that doesn't work I'll put up some masking and then get the black spray cans and some plastic primer. With the limited sight in the rear view because of the hatch in the back, I was looking for a solution so I installed a Rear View Mirror Dash Cam 10-Inch 1080P Full HD Touch Screen with 720P 140°Wide Angle Waterproof Rear View Camera, Front Rear Dual Lens Car DVR Driving Recorder, G-Sensor, Loop Recording. There were other expensive ones that do the same thing but I settled on this, so far it has been great!